There has been a lot of new snus products coming out lately and it's a bit frustrating that I can not try all these tempting new products. However I have a life growing in me that I don't want to expose to any nicotine intake. Anyway, thought I'd share two of the favorites I'm longing to try. Also check out the new Al Capone flavours, bet they're awesome! Catch Thrill, Rasberry/Pepper, white mini portions. I would love to try this. Guess the pink can is very appealing to me and also the flavour of Rasberry/Pepper sounds wonderful. Both F and my friend Victoria is using this. The smell is incredible and I just can't stop smelling this snus (which is kinda self-torture since I know I can't have any)! Really like the design of the can and that they made this flavour in strong portions. 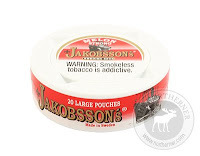 I have asked my friend Victoria to write a little review of this snus. Will be up later today.